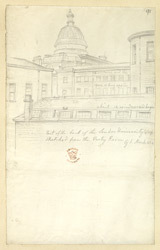 This drawing depicts the dome of the main building to University College, London. UCL is England's third oldest university, being founded in 1826. The main building, characterised by a large portico and dome, was designed by the architect William Wilkins. It was the first university to accept students irrespective of class, race, age or gender and was the first establishment to educate women on equal terms with men. Many influential people have studied and researched at UCL, such as Mahatma Ghandi, Alexander Graham Bell and Rosalind Franklin. Vitamins, hormones and inert gases were discovered here.